Although many people believe that one human year is equivalent to 7 dog years, the conversion is actually more complex. Dogs age similarly to cats, with an accelerated first couple of years bringing them into young adulthood and then a gradual slowing until each human year equates to only around 4-6 dog years, depending on the size of the dog breed. Large dogs age faster than small dogs and cats on average. The following is a conversion of human years to dog years for different dog sizes. See How Long Do Dogs Live? for information about the typical canine lifespan and videos featuring the world’s oldest dogs. 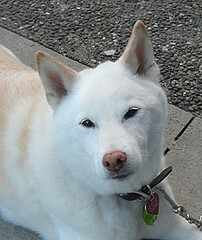 For a full list of dog articles, see the main Dogs page.